The kite fishing club day at Muriwai was canceled on March 8. The forecast was for up to 35 knots of north easterlies and rain, sounded very much like perfect west coast weather. The reality though was we were lucky if it was 10 knots. It was my first time out with my upgraded Dropper Rig and I first tried with the Nighthawk Kite setting 10 hooks but quickly found I couldn't get the gear through the strong rip and high surf. 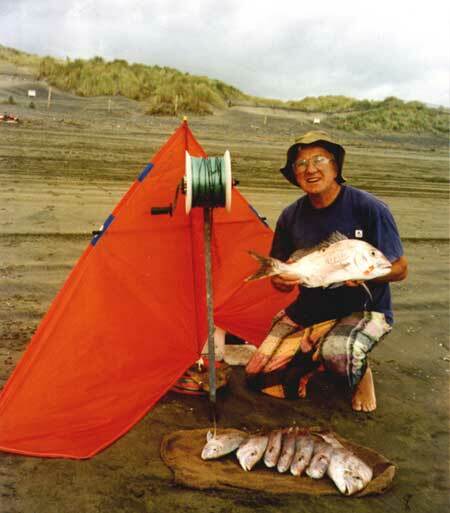 Bodo Luckfiel with his great catch of snapper taken at Muriwai Beach using a 65kg dropper rig and floating bead traces. Note : Once again the biggest fish was taken on a floating bead trace. The bead was crunched in two by the snapper. Not wanting to waste fishing time I pulled the whole lot back in and tried again with the Nighthawk, Skyhook and only 5 hooks on the set. This time I had no problems. The power of the Skyhook easily pulled the line straight out no sweat. At around 400 meters out I put on my Flexiwing Kite as well to keep the mainline up and clear of the strong current running up the beach. The line went out so fast I had to put the brakes on the reel to stop the Flexiwing kite from overtaking the Nighthawk kite. When the gear reached 1000 meters offshore, out came the coffee for a well earned 20 minute break while the gear was fishing. My first five hook set produced 2 nice snapper and 1 shark. The second set returned with another 2 snapper and a kahawai. The kahawai quickly became the new fresh, bloody and still quivering bait for the third set. Fresh bait was obviously what the snapper were waiting for and the final set produced the best catch of the day, 4 snapper up to 2kg from only 5 hooks set. It was a great day, 10 fish from only 15 hooks set. I have noticed something strange happening with Paul's floating beads. I don't think snapper like them very much because they keep attacking them! I had two double bead traces and one single bead trace on my last set. One trace with the double beads was bitten off. The second double bead trace looks like it went through the Iraqi war, absolutely trashed to bits. Could it be that this is a good product? Remember, a northerly kicks OFFSHORE on the west coast and is easily fishable. A northerly blows about 45 degrees off at Muriwai Beach and, because the rip normally comes up the beach, you don't usually even have to tack your kites to fish it. Kitefishers Catching Good Hauls - West Coast. The end of March was a fantastic time to be kitefishing on the west coast. Reports of plenty of snapper have been flooding in from North Cape to Mokau in the south. Muriwai Beach in particular has been consistently producing good hauls of snapper, gurnard and kahawai during the recent northeasterly winds. Forest and Bird have proposed a Marine Park which will extend from the Kaipara South Head to Port Waikato. Within this massive area it is proposed to limit visitors and their activities. It is also proposed to create no take marine reserves and have different management for fisheries within the area. Vehicle access on the beaches may also be at risk. If you wish to submit for or against the proposal a form can be found at the following link. Don't Be Complacent, they are out to control your recreation and seek to impose their minority ideology on the general public at the expense or our sustainable recreational and food gathering activities. Submissions close 30/4/2002 Dont let them get away with it! We spent a few days kite fishing from Ninety Mile Beach, between Waipapakauri ramp and Hukatere. We had three excellent days fishing with 10 to 15 knot winds blowing directly offshore. Monday March 24th we had 2 sets, catching 11 kahawai and 5 snapper. Wednesday March 26th we ran 2 sets and caught 9 kahawai and 12 snapper. The best sets were Tuesday the 25th where we had 1 set with 14 fish and another set where we got 11 fish off 23 hooks. We tried setting at different distances offshore, nothing much was happening 500 metres off the beach and we found that setting 1000 metres out produced the best catches. The smallest snapper we caught over the three days was 370mm and the heaviest snapper was 3kg after being gutted. All of the fish were fat and a nice dark golden colour. Bill Hohepa's fishing calendar said it was bad fishing on these days - it just proves that a 'bad' days fishing is still better than a good day at work!!!! The best all time set we've had was 17 snapper and 1 kahawai on 23 hooks while fishing in approximately the same place about 12 months ago. Fishing his bottom longline rig on March 26 at Glinks Gully Robbie set a mixture of Target Snapper Hooks and Floating Bead Traces, baited up with salted mullet baits, 1200 metres offshore. He caught 2 snapper, 2 kahawai, (one of them a huge 3kg), 2 gurnard and 1 shark. Robbie also commented that the biggest snapper of the day was taken on a Floating Bead Trace. He said that this is the second time in a row that this has happened and he is keen to go fishing again soon and find out if it is actually the beads making the difference or if it was sheer luck. Most other kite fishers in the area are reporting landing plenty of snapper, gurnard and kahawai and even the surf casters were catching good numbers of snapper. With the surf being so low the snapper were coming in very close to the shore. Fishing my 65kg dropper rig from Muriwai on March 25 I ran 4 sets with 10 hooks per set. There was a moderate north easterly blowing and the surf was slight. Conditions were ideal and the gear was set directly offshore over the high tide. Baiting up with mullet on my 4/0 Target hooks I caught 5 snapper, 1 kahawai and 1 shark. On March 26th we fished our bottom longline rig near the Rimmer Road entrance at Muriwai Beach. There was an incoming tide, a strong northeasterly wind blowing and the surf was high. We baited up our 25 hooks with mullet and, with the steady wind, set the gear straight out. From just one set we caught a total of 13 good snapper, 1 kahawai and 3 sharks. Ed:I note from Neville and Maeve's report that they have got some photos of their catch, hopefully we will get to see them soon. While kite fishing the Manukau, Raglan area on March 26, I set my bottom longline rig baited up with mullet. The winds were a moderate northeast and there was an incoming tide. There was a slight rip running and the gear was not quite out straight but still managed two good sets. From two sets of 20 hooks I caught 7 snapper, 2 gurnard, 3 kahawai, 1 trevally and 2 sharks using 4/0 Target Snapper Hooks. We had a very enjoyable few hours on the beach but, on the way home, we passed dozens of dead or dying sharks and 2 eagle rays just left on the sand for all to see. I think we fisherman have got hard enough times ahead of us without disgusting the general public and giving the radical Greenies more things to fight against us with. Ed : Good point Roy! Come on guys and gals, if you don't want to keep fish then let them go! We have just returned from Waihi beach and are pleased to report that the lettuce like seaweed seems to have disappeared. There is quite a bit of grass like weed there but I don't think that this would be any problem as it is only about 6 inches long. We noted that there were quite a few pine trees on the beach, no doubt blown in from Matakana Island with the south easterly winds. The winds were variable, southeast, easterly and turning to north easterly late in the evening right through the 6 days that we were there. We estimate the winds were 10 to 12 knots on the beach and the marine forecast said 15 to 20 knots out to sea. There was a large swell and plenty of small rips which, even though we tried, we could not launch our torpedo. Sorry for not sending reports over the last few weeks, but we have not had much fishing on or off our beach due to the weather conditions. The weekend of the 22nd and 23rd March saw the local fishing club try to run their fishing competition on Saturday. A few vessels set off with mixed results, the best fishing was recorded at the Maddens Banks, some 25 miles off the coast. Sunday saw only 2 vessels set off from Porangahau Beach. Last weekend again saw us with northeastly winds. Merv Golan rang us on Sunday for a weather report, and headed out to the river mouth to see if they could catch another 20kg kingie, but instead dragged a net for flounders with a good catch of 20. As at writing this report we have had a weather change, hopefully this will bring the end of these northeastly weather systems we have had since January, and will bring the fish back into the bay. Then maybe we can again set our kites off the beach and get into those huge snapper we were catching on kites this time last year. If you are in the area call in and see our range of Paul's Kites and Target Hooks. Feel free to ring if you want to know what the wind and sea conditions are before heading over.